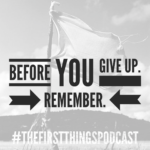 In this episode of The First Things Podcast I want to encourage you, to remind you that God’s presence, protection and provision are promised to His children. Even if the direction He is leading takes us to the front lines of opposition, we can move forward with our confidence firmly rooted in Him. I hope you’ll listen, before you give up, and keep walking in faith and obedience.